Inter-school correspondence is more than a mere pedagogical technique as it places the children in a position of real communication. The resulting school assignment is no longer some arbitrarily imposed homework but a human activity motivated by peer exchanges. School correspondence requires as well as creates some kind of welcoming climate, an atmosphere of listening and tolerance that the cooperation and interaction between every pupil in the class encourages. It gives the children the opportunity to look at their own environment with a fresh and critical eye and from various perspectives: social, cultural, political and ecological. School correspondence fosters natural learning while allowing the child to open up to the outside world. Our young children use all the forms of communication available today with internet and the new media. 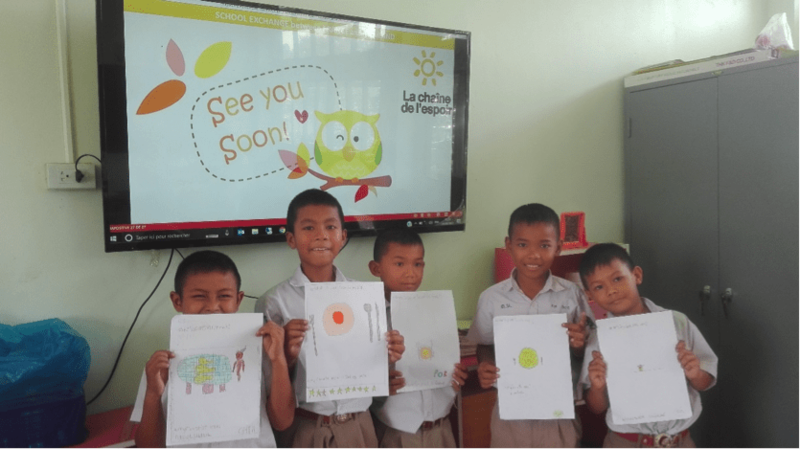 Exchanges will continue all along the school year according to defined objectives while adapting to the needs and desires of the children through varied activities such as hand-written letter, videoconference, role plays or song learning in English.